As a creative force, student of the human heart and soul, and champion of living the life you want, Oprah Winfrey stands alone. Over the years, she has made history with a legendary talk show (the highest-rated program of its kind), launched her own television network, become the USA’s only African-American billionaire, and been awarded both an honorary degree by Harvard University and the Presidential Medal of Freedom. From all her experiences, she has gleaned life lessons – which, for fourteen years, she’s shared in O, The Oprah Magazine’s widely popular ‘What I Know For Sure’ column, a monthly source of inspiration and revelation. 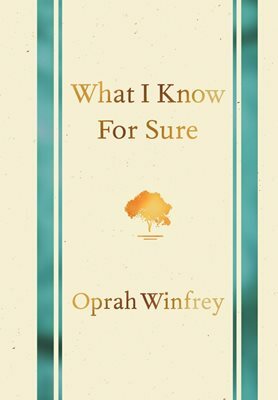 Now, for the first time, these thoughtful gems have been revised, updated, and collected in What I Know For Sure, packed with insight and revelation from Oprah Winfrey and read aloud by Oprah herself. Organized by theme – joy, resilience, connection, gratitude, possibility, awe, clarity, and power – these essays offer a rare, powerful and intimate glimpse into the heart and mind of one of the world’s most extraordinary women, while providing readers a guide to becoming their best selves.